WORLD OF GAIA is a Bulk Stones and Gifts Company. We sell to retail buyers, artists, stores, and manufacturers. Our prices are designed for the buyer who is looking for quantity in a single item or a variety of products. DISCOUNTS: The 1/2 pound packages of stones and sets of stone gifts and jewelry items are priced lower than if they were purchased individually. This makes it possible to resell the items if the buyer is also a seller. 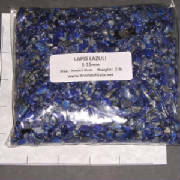 We offer 2 pound packages of stones at an additional discount. In addition, if the total purchase is 10 pounds or more, we refund 10% of the purchase. If you need a special order for a quantity of stones or for stones not listed on our current site, please contact us. We have a large number of items not currently listed. We also do special orders for quantites of bags of stones for weddings, giveaways, and special gifts.